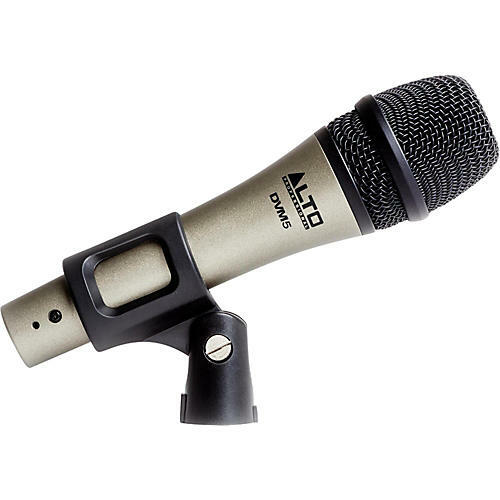 The Alto DVM5 is an outstanding all-around vocal microphone, ideal for everything from energetic country music to sultry, emotional jazz performances to high-volume rock lead singers. The keys to the DVM5’s flexibility and wide-ranging capability are its outstandingly low noise floor, its ability to easily handle very high SPL levels without objectionable overload or distortion and its wide, smooth frequency response, specially tailored to enhance lifelike vocal reproduction. The DVM5 is extremely tolerant of varied climate conditions, making it especially well-suited to outdoor use, plus it comes with a mic clip for convenient attachment.